Eclipse Day and Tennessee for the BIG EVENT - - PAGE 421. 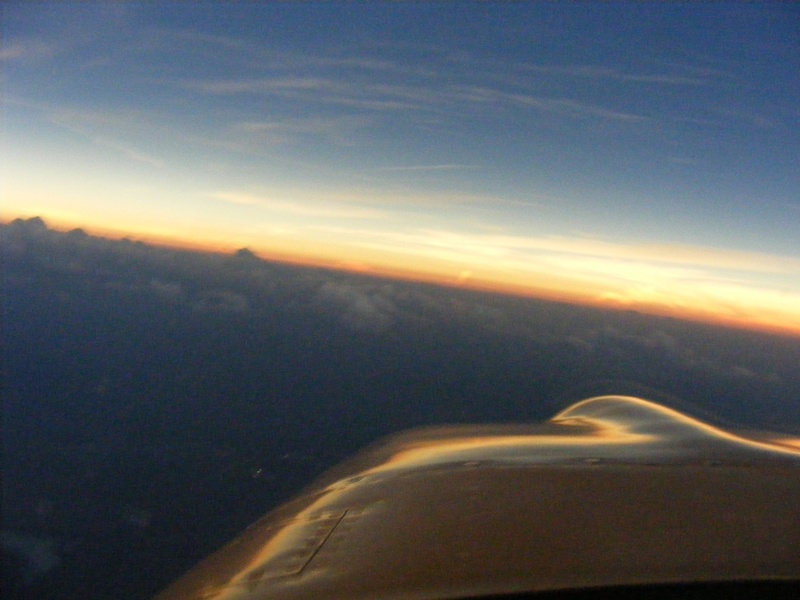 Eclipse Day and Flying to Tennessee for the BIG EVENT · · PAGE 421. 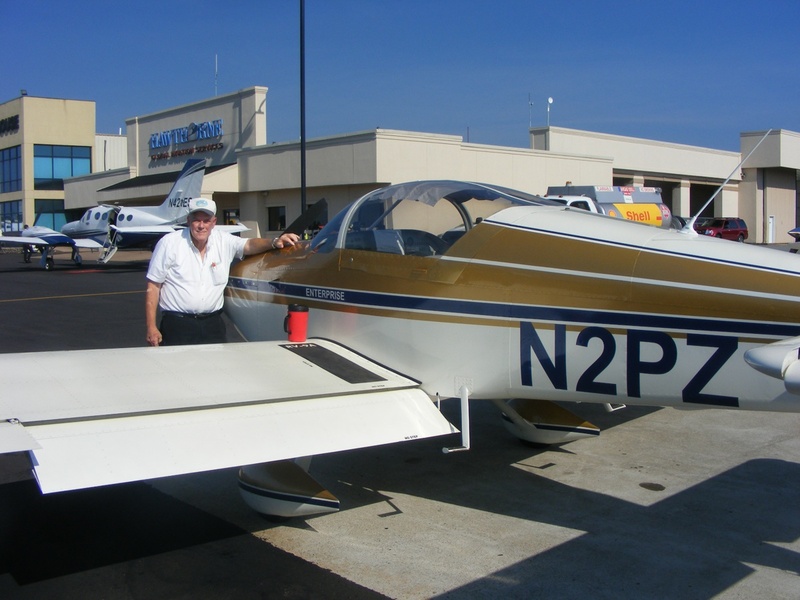 August 21, 2017: Eclipse Day is here and I have to fly south to the Kennesaw Airport (KRYY) to meet my son for brunch and be back in the air before 12 noon for the 1-hour flight up to the Smithville, Tennessee airport. I was up early today to get the airplane repacked in advance of my departure around 9:30 AM for a flight that should be about 30 minutes to the Kennesaw Airport. The clothes I wore on Saturday and Sunday get hung up first in the baggage area behind the seats. My tool box is on the deck under my black computer bag. 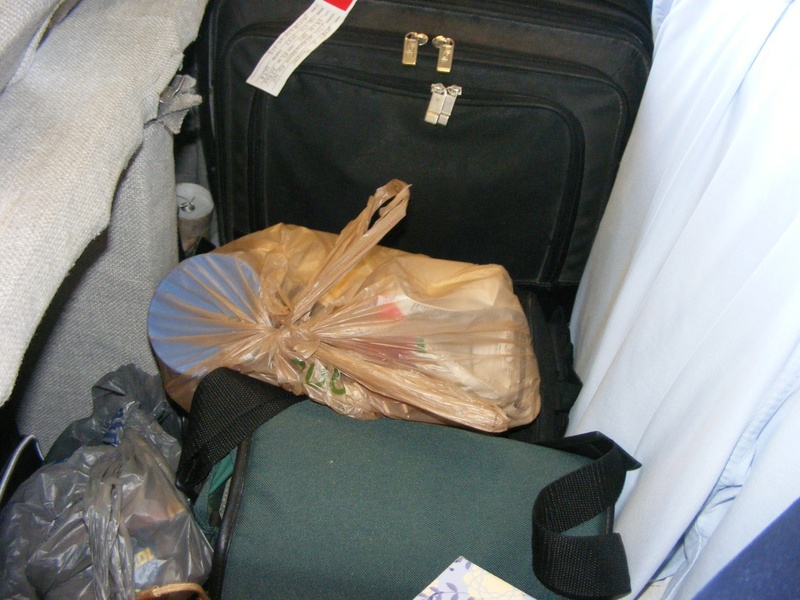 That plastic grocery bag with snacks is on top of my insulated cooler bag I used for the trip up from Florida. It has frozen water bottles inside to keep my sausage biscuits refrigerated during the flight north. I also have a large Hershey's Dark Chocolate bar in there inside the inner bag with more ice bottles and flat freezer bags. The Green bag has camera equipment inside including solar filters to focus on the sun directly and protect eyes as it is a single-lens reflex camera that has mirrors to the viewing lens. The last thing that goes in the back is my pillow from home that goes with me everywhere. 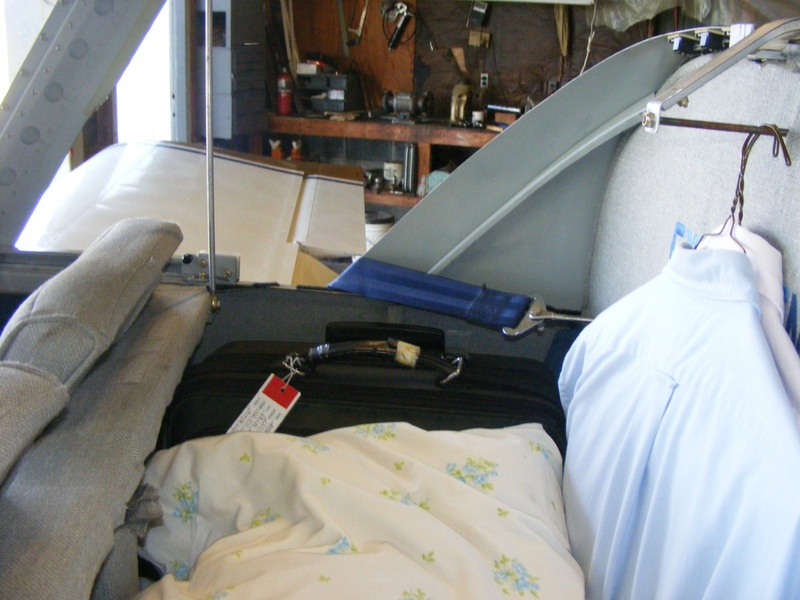 When the airplane is outside and ready for engine start, my RED Bogie tow bar will be atop the pillow and below the BLUE shoulder straps thrown over the seats. 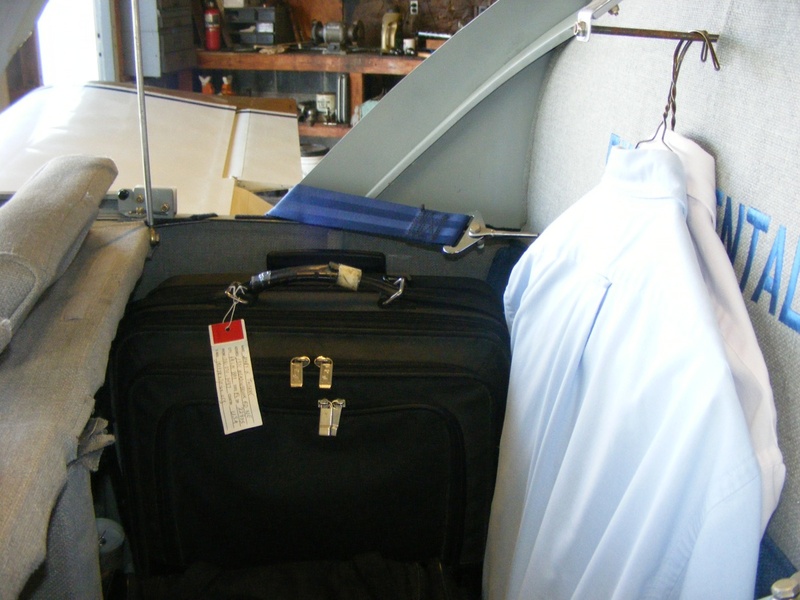 I leave the shoulder straps outside when loading and unloading the baggage area. Wendell was expecting two fly-in guests today. One of them came just as I was planning to start my engine. I waited for him to land and park his plane before I got started and took off southbound toward Atlanta at 9:31 AM. It was 9:48 AM as crossed over the top of the Calhoun, Georgia airport and began following Interstate 75 toward my first stop today. The image below was taken at 9:53 AM from my position just north of Cartersville, Georgia looking west at the cooling towers for a power plant, located on the Etowah River about halfway between Cartersville and Rome, Georgia. I am flying at 3,900 feet to clear rising terrain in some low mountains ahead between here and Kennesaw. The terrain in this area varies from 750 feet to 1,000 feet MSL with some low "mountains" that are higher. The taller mountains in North Georgia are the south end of the Appalachian Mountains. The highest point in Georgia is Brasstown Bald Mountain at 4,784 feet above mean sea level. The last GPS data point of this morning flight was recorded at 10:06 AM at the location seen in the image below on the north ramp at McCollum Field (KRYY) at Kennesaw, Georgia. It is Hawthorne Aviation. We went to the Cracker Barrel Restaurant at the Kennesaw exit from Interstate 75 for a good meal and were back at the airport before 12 noon to get on our way to the Smithville Airport (0A3) in central Tennessee, located only eight miles from the centerline track of the Eclipse that will be going into totality at 2:30 PM Eastern Time today. We did not take any photos on the way from Kennesaw to the Smithville Airport. We did have some good conversations as this is the only the second time Marshall has been for a ride in my airplane. 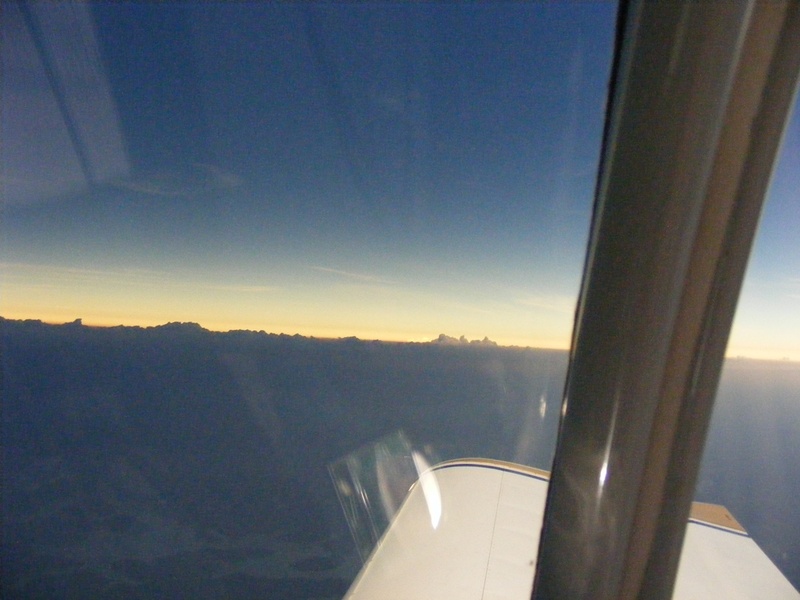 This time it is a good cross-country flight with plenty of things to see along the way. We pulled onto the runway at 12:00 Noon and took off heading north after climbing out from runway 27. 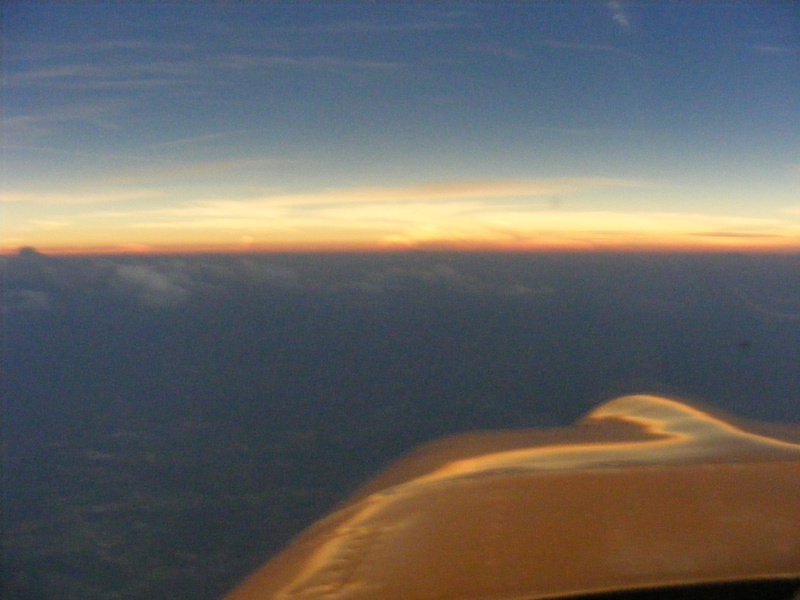 We crossed my home town of Dalton, Georgia heading north at an altitude of 7,500 feet MSL at 12:27 PM. 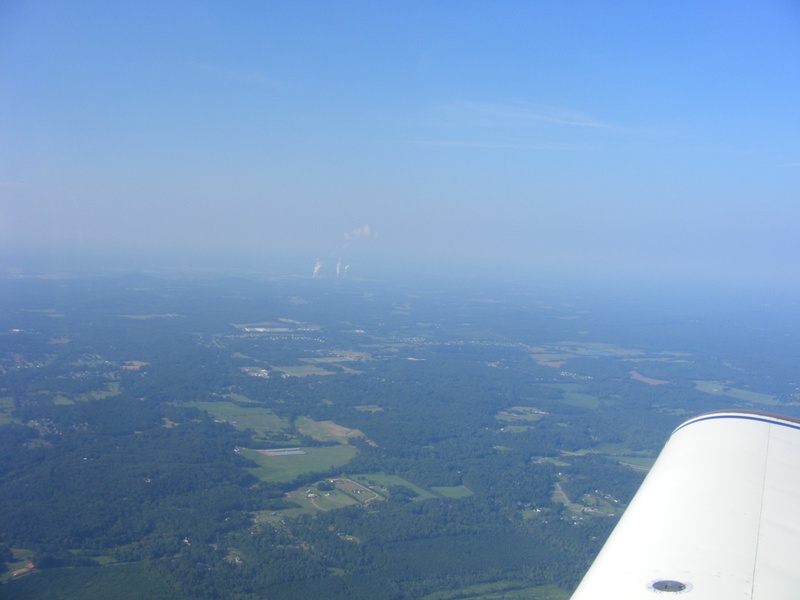 We crossed the Chattanooga Airport at 10,500 feet at 12:37 PM and continued climbing as we crossed the Tennessee River on course for Smithville. 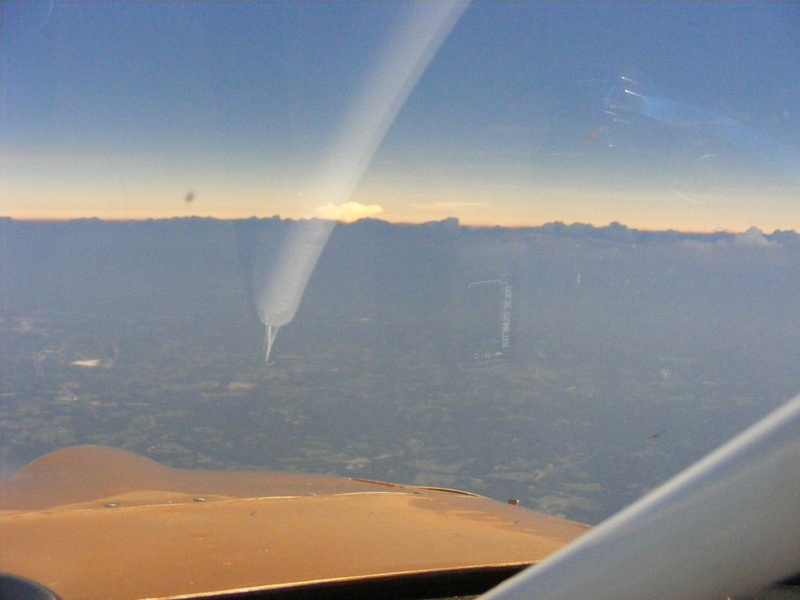 I handed Marshall my yellow cloud telescope that allows you to look at the cloud tops ahead to know if you need to climb higher to remain in VFR conditions. 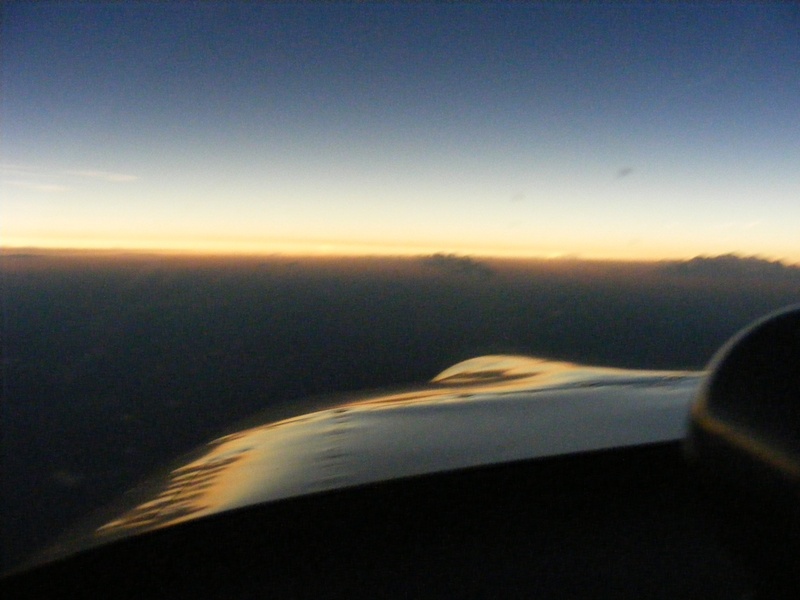 We leveled off and found a bit of a tailwind to raise our ground speed above 160 MPH. There were clouds over the mountain ranges adjacent to the Sequatchie River Valley near Dunlap, Tennessee. 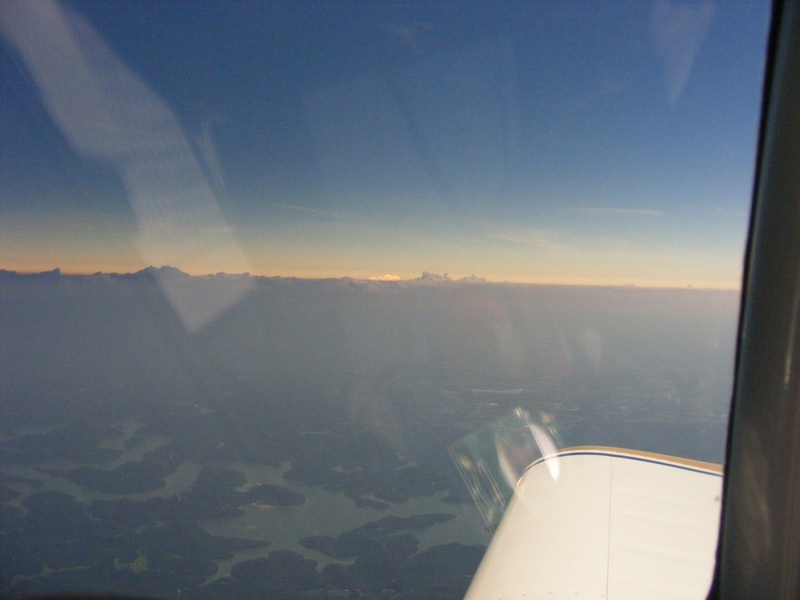 With those clouds behind us, the descent toward the Smithville Airport was around some scattered clouds in the basin near the Center Hill Lake north of McMinnville, Tennessee. We got in line to get fuel at 1:09 PM Eastern Time with only one airplane ahead of us. I talked with the pilot of that Cessna 182 and asked him if he is staying on the ground to watch the Eclipse. When he said yes, I explained we are going up above 10,000 feet to get above the haze and clouds to see the big event. He agreed to let me go ahead of him at the fuel pump to insure I could get away on time to get up there. I started to put in 22.77 gallons of fuel and sent Marshall to the FBO rest room and to also take some photos on the ground before we go. I did not take my usual photo when Enterprise was parked at the fuel pump. 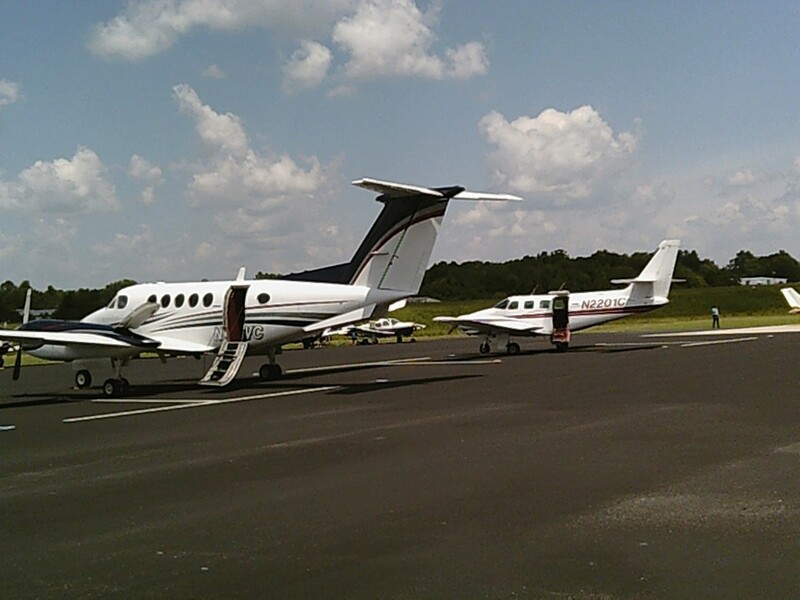 Here are the two ramp photos from Marshall on the ground at Smithville Airport. There are several Van's RV's on the south side of the ramp between the fuel pumps and the FBO located at the middle of the ramp. This image is looking East with the fuel pumps just out of the picture to the left. A couple of airplanes are in the middle of the ramp with more parked along the north edge of the ramp. The runway is beyond the grass north of the ramp. Those folks on the grass had put up sun shade tents and brought out their lawn chairs. One of the RV pilots on that side of the ramp had a pinhole device taped in the middle of square of cardboard. The cardboard provided shade for a white sheet of paper below where the pinhole of light was projected showing the image of the phase of the Eclipse before totality occurred. Two of the RV pilots had met me before and recognized my airplane when I landed. 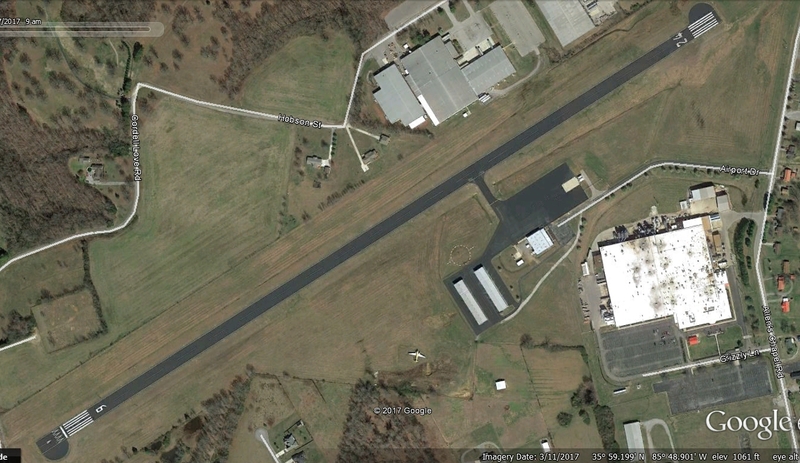 Here is the Google Earth view of the Smithville Airport (0A3) with north UP in this image. The fuel pumps for AVGAS and JET A are on the East end of the ramp with a white concrete pad in front of the fuel tanks and pumps. You can see all the details about this airport via this WEB PAGE. Joe Johnson is the airport manager I had talked with in the past few weeks. I met him and his son while I was on the ramp. 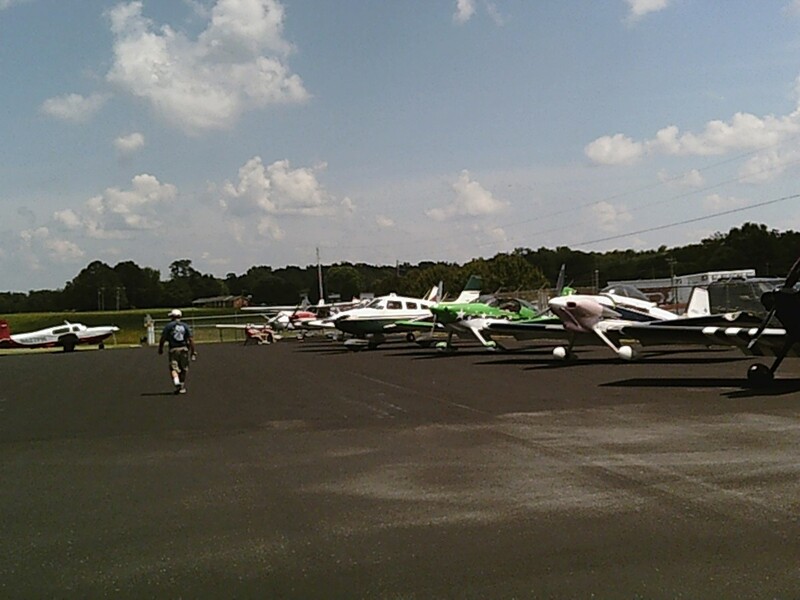 The guys handling aircraft parking for the event were surprised when I waved them off after getting fuel. 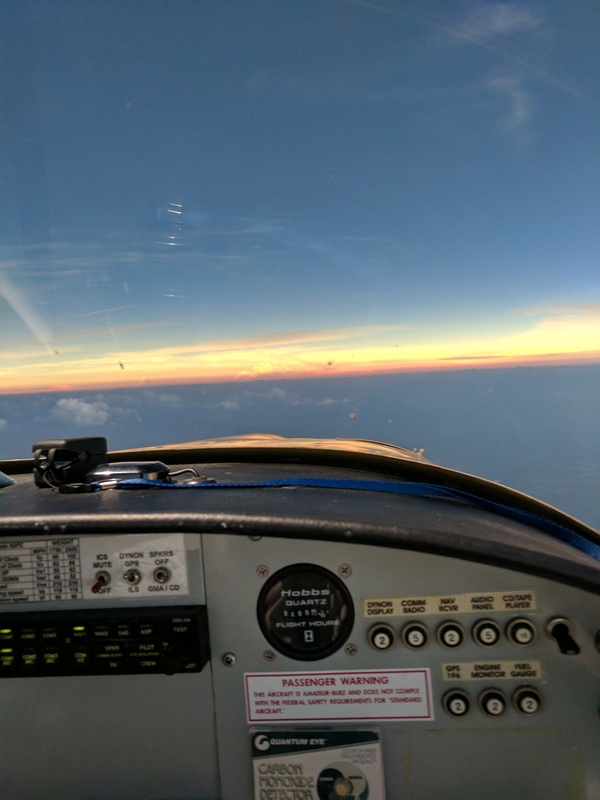 I had moved my airplane up in front of the FBO office for a rest room visit and let them know we were leaving very soon going up above 10,000 feet to see the Eclipse. 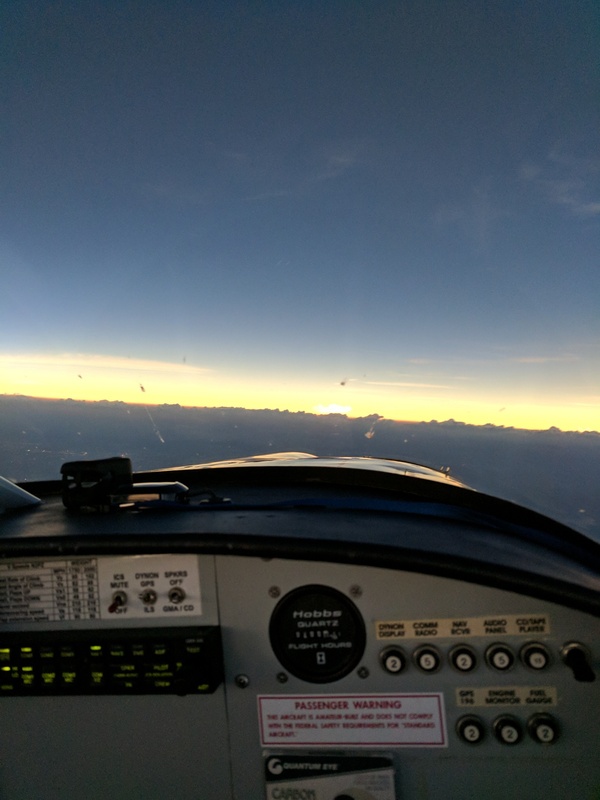 The takeoff time from the Smithville Airport was at 1:55 PM Eastern Time and the climb to altitude was a race against the sun and moon passing over our area at 2:30 PM. 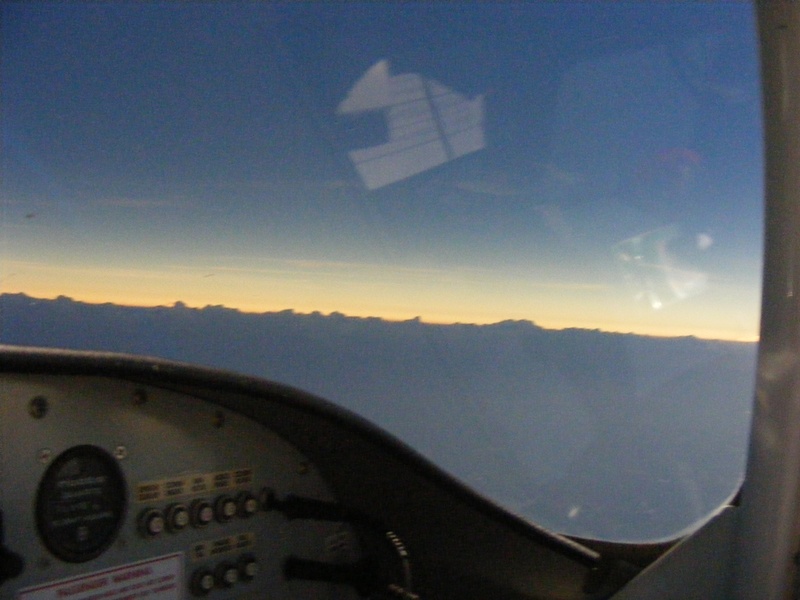 I started my onboard video system before takeoff and all that we said during the event is preserved on digital video tape with the video from my dash-mounted camera above the control panel. The field elevation there is 1,080 feet above sea level, leaving another 9,420 feet to get to the altitude where I want to see the event. We may have gone higher as I will determine via the GPS data from the flight. We reached 2,062 feet by 2:00 PM as we have two of us on board and full fuel. The high temperature down near the ground did not help and it showed up on the oil temperature readings. Our altitude reached 3,093 feet by 2:06:40 PM. At 2:11:01 PM we reached 4,142 feet and I had reduced the climb rate to get more speed and better engine cooling with the extra speed. We reached 5,097 feet at 2:12:32 PM where I lowered the nose slightly to give up 100 feet to reach a speed of 161 MPH before making the next step climb to a higher altitude. The digital camcorder intercom audio was capturing all our conversation as we raced the clock to get above the clouds that surround this area of Tennessee. We reached 6,069 feet at 2:15:36 but our speed was back down to 137 MPH as a result of the climb. I was keeping an eye on the oil temperature and the cylinder head temperatures. At 2:18:34 PM we passed through 7,031 feet doing 130 MPH over the ground below along Interstate 40 in the Buffalo Valley area. The climb to 8,035 feet was reached at 2:20:59 PM with 9,029 feet reached at 2:23:31 PM. The minimum goal of 10,503 feet was achieved at 2:29:50 PM as the total eclipse begins. Here is what we saw outside with a snapshot camera at 2:27 PM as we are flying northwest near the Eclipse center line path. And now you can see the shadow of the moon over the nearby clouds in this photo I took. The soft glow on my cowl is from the Sun's corona (atmosphere) peeking out all around the moon. 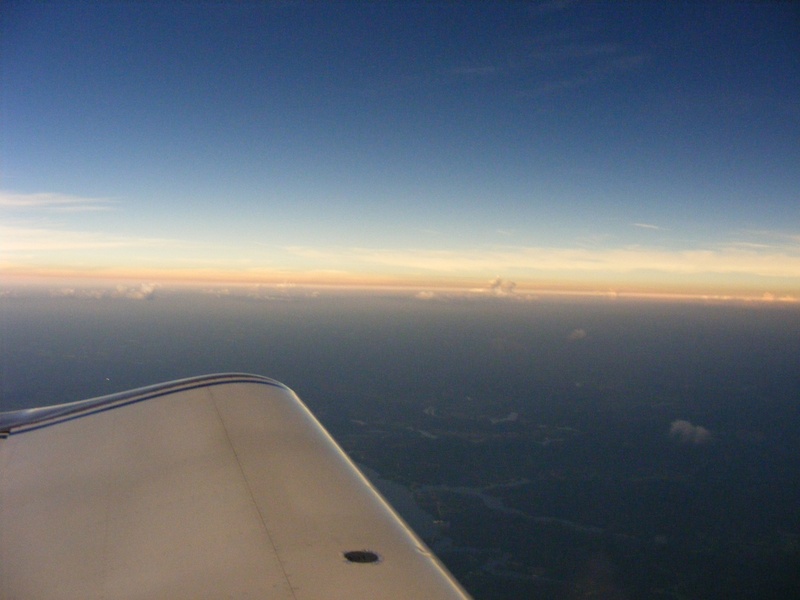 This first image in-flight taken by Marshall at 2:28:20 PM Eastern time is just before the total Eclipse using his cell phone camera looking northwest at the approaching shadow. These next photos were taken during the time from 2:28 to 2:29 PM. Compare the brightness of the top of the engine cowl to the image above. 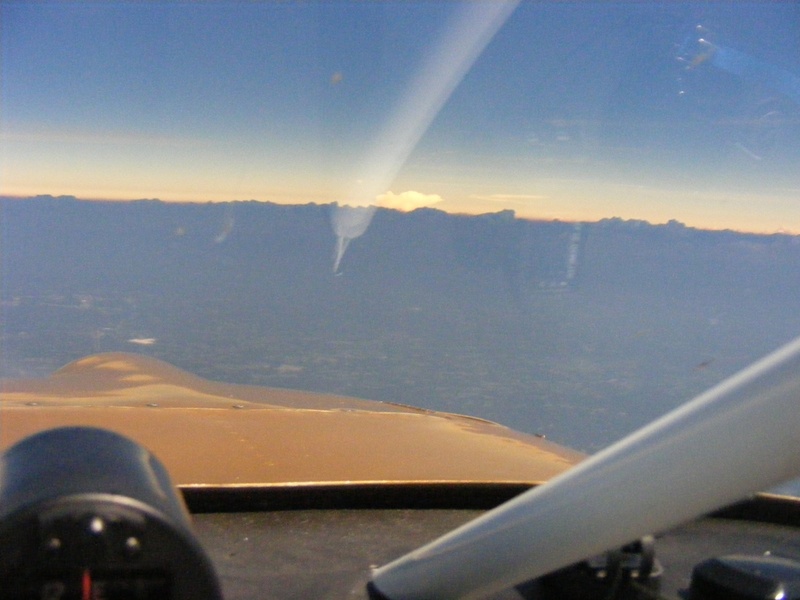 The airplane is banked left as we are turning left to put us on an eastbound track to see the shadow moving on a heading of 123 degrees magnetic. During the turning procedure cameras will be pointed in all directions. The dash-mounted video camera, my snapshot camera, and a pair of cameras my son brought are all being used today. Here is Marshall's photo taken at 2:31:25 PM at about the same time as my photo just above. 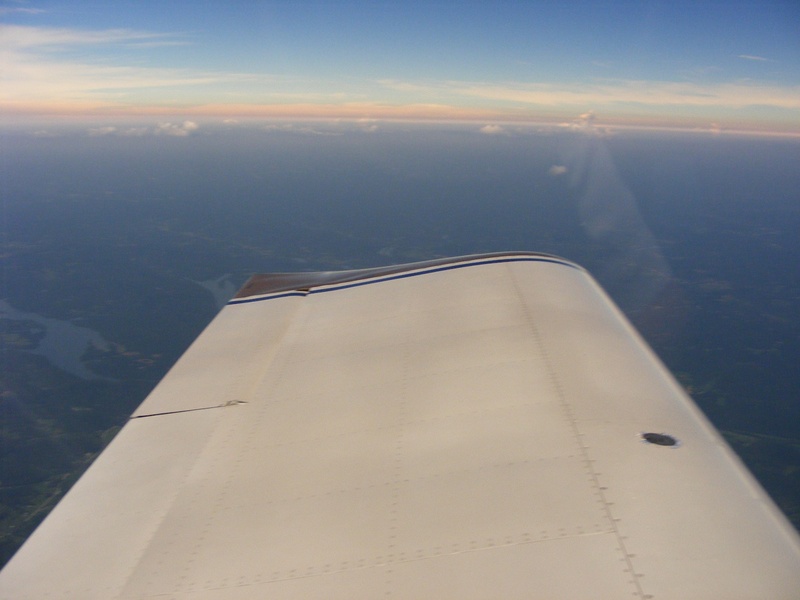 When we landed at the Smithville Airport in the Central Time Zone, the clock in his phone was set to Central Time. His image file names show a date code based on Central Time. My digital snapshot camera and GPS are both set to display Eastern Time. 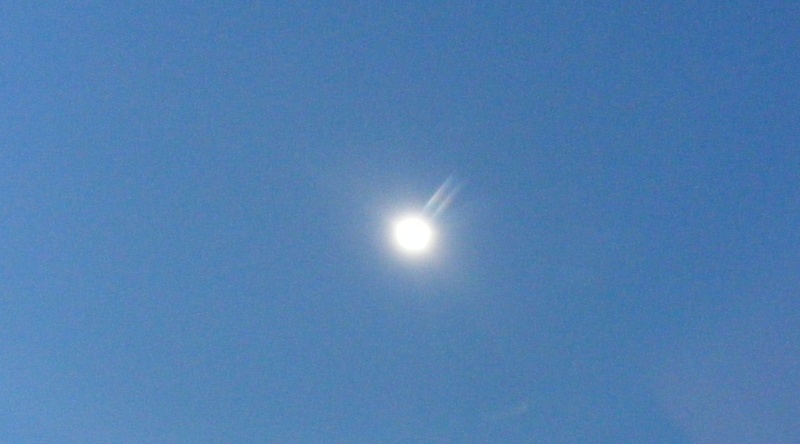 When I turned my snapshot camera straight up at the event, this bright sun image says to me "What Eclipse?" Seeing this now, I realized that I did not set the shutter speed and exposure to MANUAL instead of AUTOMATIC, which is used for most pictures like the ones seen above. 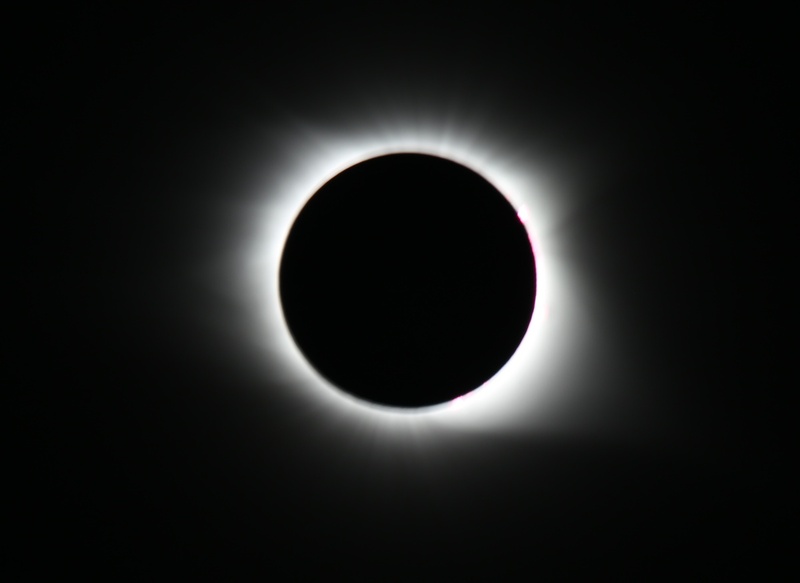 I looked up there with my eyes and the moon was indeed blocking the sun and the sky was dark beyond the sun's corona clearly visible with the naked eye. David Goff was looking at the Eclipse from Andrews, NC and got this tripod-mounted camera image at totality. 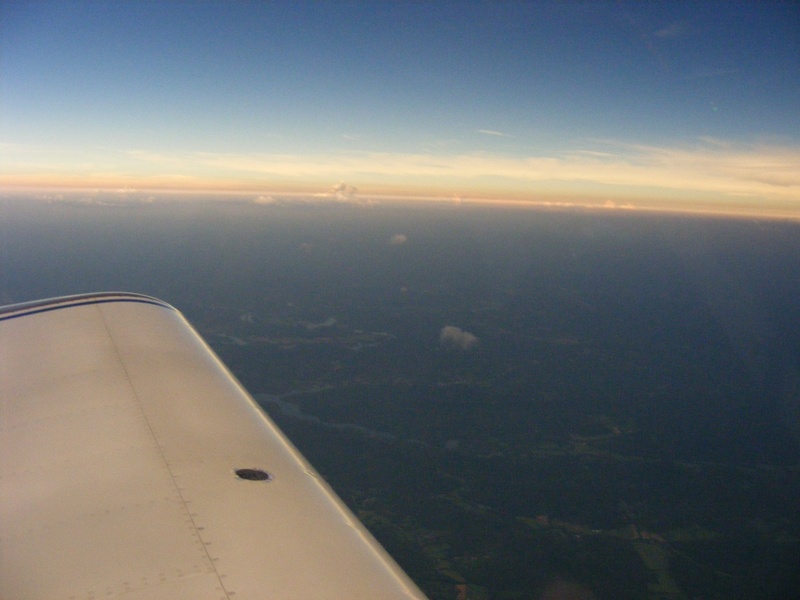 This is how I saw it with my eyes from above 10,000 feet in Central Tennessee from my airplane. Thank you Dave for sending me this wonderful image. Dave is the Director of Engineering for the company that provides my day job. We have known each other since January 2006. He was on vacation during the week of the Eclipse. These images are from my handheld camera and this one shows the moon looking like the sun, but something to take note of is VENUS in the bottom right corner of this photo. Now you can see how much the shake was during the duration of the exposure. 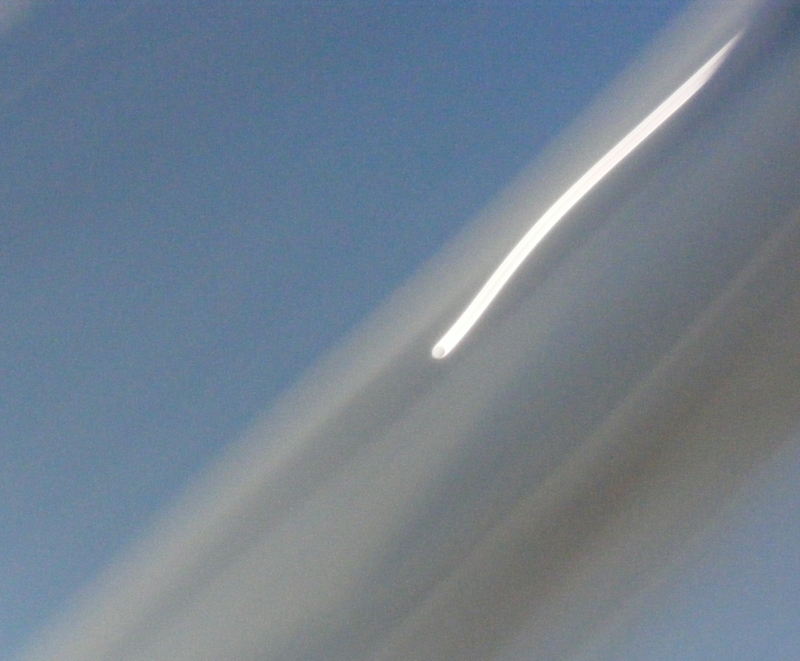 That shape of the Venus shake action makes it look like an airplane in a turn. The automatic GAIN feature of the camera turned the sky BLUE even when our eyes looked at a black "night sky" above. Just looking at the dark engine cowl out front confirms we are still in the moon shadow and looking south. At this point, the "sunrise" is all around us. This photo is just a few seconds after the one above, but looking along my left wing as we continue the turn toward the southeast. And yes, with the perceived bank angle, we are actually climbing during the turn. We are above 10,650 feet and moving at 140 MPH. All those clouds in this view are inside the dark shadow of the moon. The high-altitude cirrus cloud layers are very high and very far away. To get the idea of how dark it is on the wings of my airplane, the wings are painted Pearl White, the same as my old 1996 Caddy. 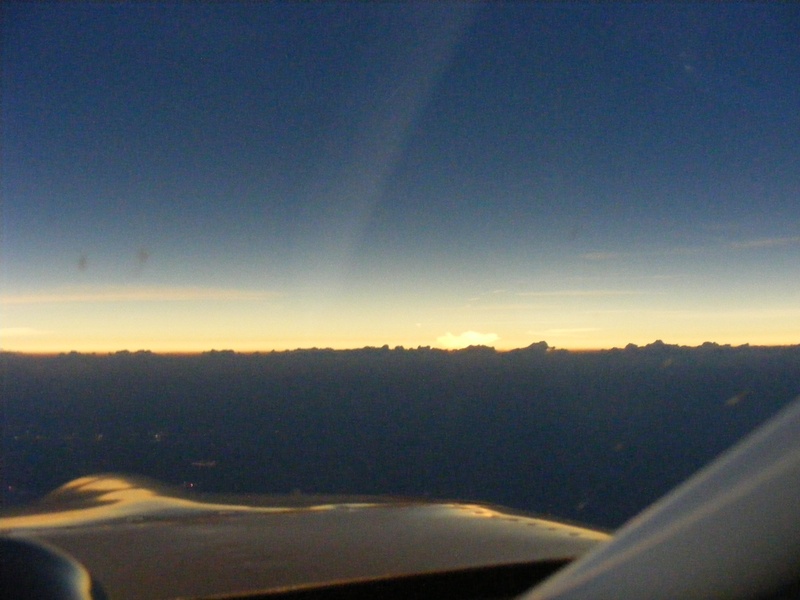 The top of the wings are quite dark, but leading edge of the wing is reflecting light from the horizon ahead. Sometimes you have an accidental photo and this one below is one of those. The BLUE background is the automatic exposure of the camera, but that circle followed by a smear during the exposure is indeed the reflection from my windshield roll bar showing the dark side of the moon and the corona of the sun above our location as the camera is moving in my hand. This is NOT a rogue comet photo. I could not have staged this, and truth is really stranger than fiction. Meanwhile, the next image shows the local environment outside. We are now ONE minute into the 2 minutes 39 seconds of totality of the Eclipse and we are now chasing the shadow SOUTHEAST on a heading of 123 degrees magnetic. The local clouds are all in shadow and that ONE distant white towering thunderstorm cloud is still EAST of the shadow. The reflection of the steel brace in the center of the windshield gives an idea of how bright the sunlight is for each photo in this series. The reflection is very faint here. Just after the image above, I turned my camera toward the NORTHEAST to see more daylight and the lake below is now more visible as the end of the total Eclipse is coming fast. Compare the amount of light on the left wing here to the photo three images above here on this page. 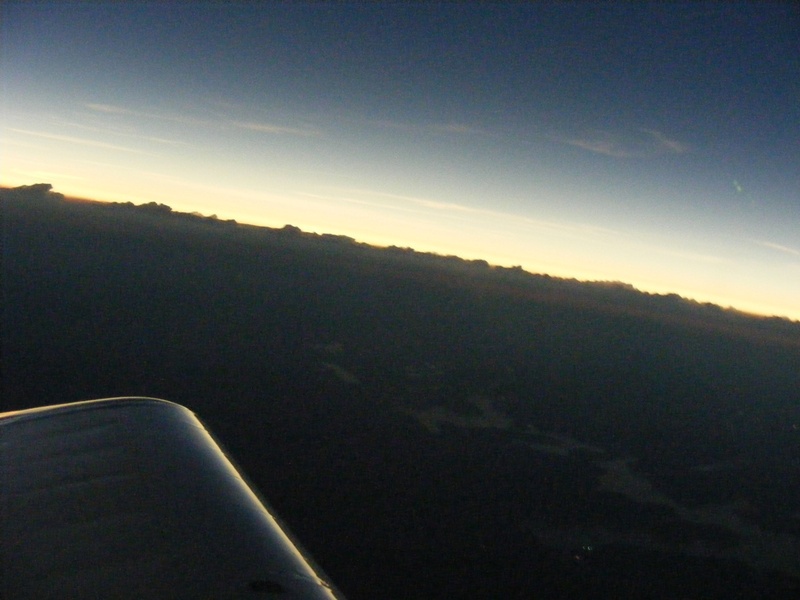 The view looking south past the right wing is much brighter now as the end of totality is here. Another look north shows how much the little clouds nearby are closer to aligning with the left wing. Compare this image with the second photo above this one. 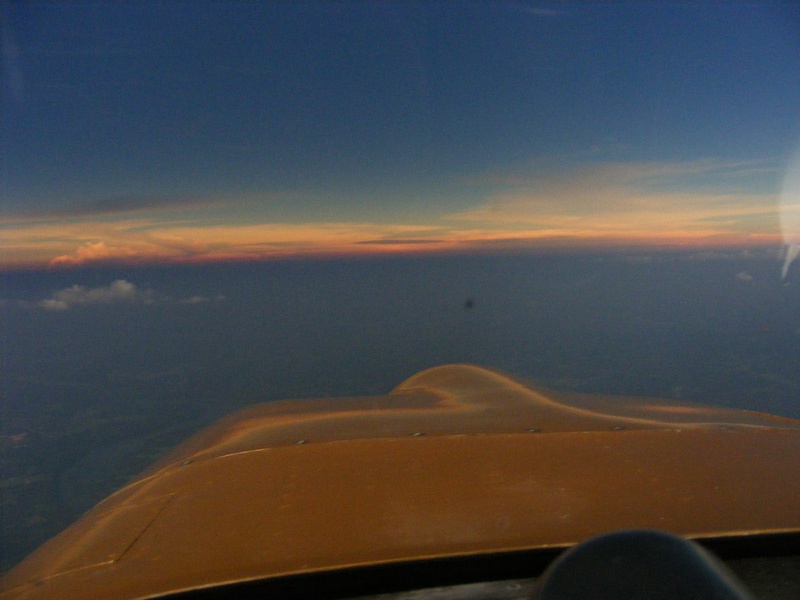 The airplane is currently on an easterly course so the camera view below is southeast and those clouds are still in the moon shadow about 10 miles from our location. Look at the shadow on the instrument panel. And just like that, we are now out of the shadow, but there are still dark clouds ahead, and that tall thunderstorm cloud is over 100 miles away on the other side of the shadow and we know the diameter of the moon shadow is about 73 miles wide. The reflection of the brace bar from the windshield is now much brighter. We are still on the southeast course. You can see the top of my pulse oximeter and the blue wrist strap in reflection from the windshield in both the photo above and the one below. The lake below is reflecting more sunlight now while the clouds ahead are still in shadow. Can you tell I keep scanning the horizon to take snapshots of the changes in multiple directions. 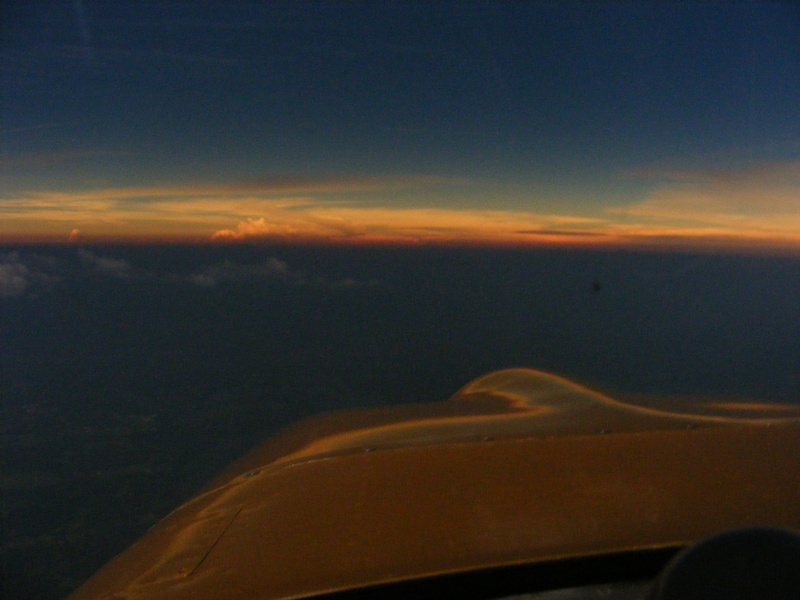 The airplane is heading East and climbing toward 11,500 feet before the turn toward Chattanooga and Kennesaw to end the Eclipse adventure that lasted only 2 minutes 39 seconds here in Tennessee.